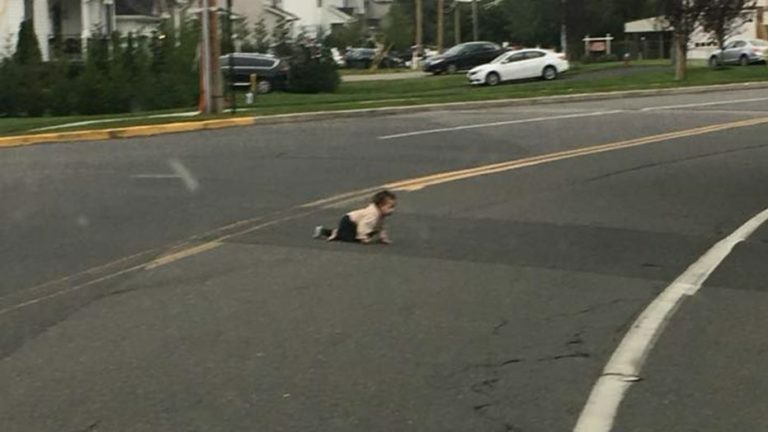 A photo taken by a concerned motorist showing a toddler crawling on a major road in the US has gone viral. Police in U.S. have begun investigation after a crawling baby girl was rescued from death on a New Jersey road on Saturday. A motorist Cory Cannon of Eatontown who spotted the child, told the Asbury Park Press he noticed the toddler crawling across the road in Lakewood at around 5 p.m.
“I thought it was a toy or something until she moved,” he told the newspaper. Cannon said he then watched a neighbor come out to the street and return the baby to her home. He then posted a now-deleted photo to Facebook of the child, which has since gone viral on social media with people sharing and commenting on the stunning sight. Lakewood police told NJ.com the family had no idea the child had gotten out of the home, and that a door may have been left open by an older sibling. The mayor of Lakewood, Ray Coles, told the Asbury Park Press that workers from the state child welfare organization have also been in contact with the baby’s family. “Anytime you have a child that’s endangered they get involved to make sure the child is safe,” he told the news outlet.